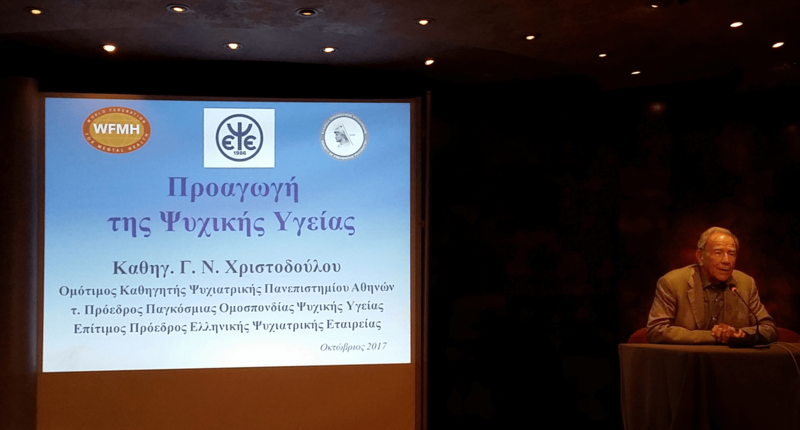 Professor George Christodoulou, President of the Society of Preventive Psychiatry during his speech. | SOCIETY OF PREVENTIVE PSYCHIATRY - WFMH, WASP MEMBER AND WPA AFFILIATE MEMBER. ΕΤΑΙΡΕΙΑ ΠΡΟΛΗΠΤΙΚΗΣ ΨΥΧΙΑΤΡΙΚΗΣ - WFMH, WASP ΜΕΛΟΣ ΚΑΙ WPA ΣΥΝΔΕΔΕΜΕΝΟ ΜΕΛΟΣ. Professor George Christodoulou, President of the Society of Preventive Psychiatry during his speech.